A detailed look into covering the ancient tropical environment that formed the chalk, when dinosaurs ruled the earth and marine reptiles ruled the seas. 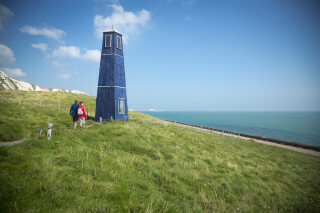 Volunteer programme of easy to do half day conservation tasks taking part at Samphire Hoe. This course will provide an overview of Kent’s mammals, small and large, with a focus on their ecology, reproduction biology and conservation issues. Their habitats and distribution in Kent will also be covered as well as a behind-the-scenes tour of some of our captive breeding areas. Want to experience one of Dungeness's most marvellous spectacles ? Enjoy a cooked breakfast in with all the wildlife ? This is your opportunity! Join Chris on one of his friendly strolls for a wander to the Bay enjoying the banter and search for seals. Voluntary clearing of the Alexanders plants from the pathways along with other restoration. A guided cycling trip taking you along coastlines, country lanes and historical buildings. Short walk providing an introduction to the local geology and the fossils that can be found and explain why the landscape around East Wear Bay looks as it does. Enjoy this beautiful 5½ mile guided walk via Toy’s Hill to Emmetts and back organised by Westerham Ramblers. The third Tulip Celebrations event as part of the Tulip Festival at Hever Castle & Gardens. Voluntary footway and litter clearance. Join an easy walk through High Meadow and along the top of Whinless Down enjoying the stunning long reaching views whilst you observe and record the wildlife as we go. Volunteer to help improve and restore the paths at Folkestone Downs. Volunteering Event – Wed 1st May – En Garde! Join us for a task in this ancient woodland carrying out a survey of the rare lady orchid and spending time identifying and recording other woodland plants. Everyone is welcome to join White Cliff Countryside Partnership in any of the volunteer tasks. A voluntary programme of easy to do half day conservation tasks at Samphire Hoe to help restore the site. This is an exciting opportunity to learn and be inspired by a very knowledgable forager - Fergus Drennan. Bring out the Bear Grylls in yourself on his picturesque walk. Join a slow walk up onto High Meadow and Whinless Down stopping to forage for wild spring leaves. Celebrate 10 years of the Pilgrims Hospices cycling challenge and make a difference to the lives of thousands people living with an incurable illness. Join us for a yoga session in the woods. Hargate Forest is at the southern edge of Tunbridge Wells. Come along to the nature reserve and enjoy a gentle walk around.